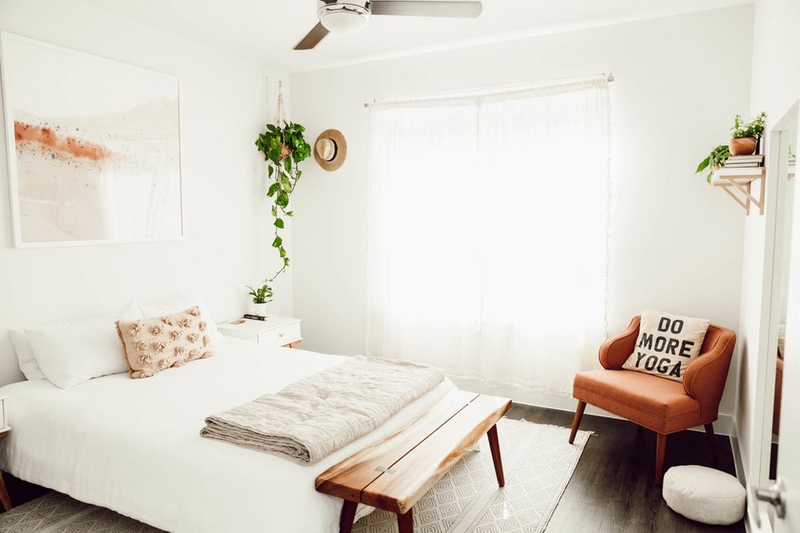 When , the darling matcha- and plant-loving wellness pioneer behind healthy living blog , recently asked us for help designing her new one-bedroom apartment in Austin, Texas, we didn’t just stop with her living room. To round out the apartment for Jules and her husband Andrew, Decorist Classic designer Erika Dale helped the couple pull together a restful and calming bedroom oasis that captured both their laid-back styles and needs. 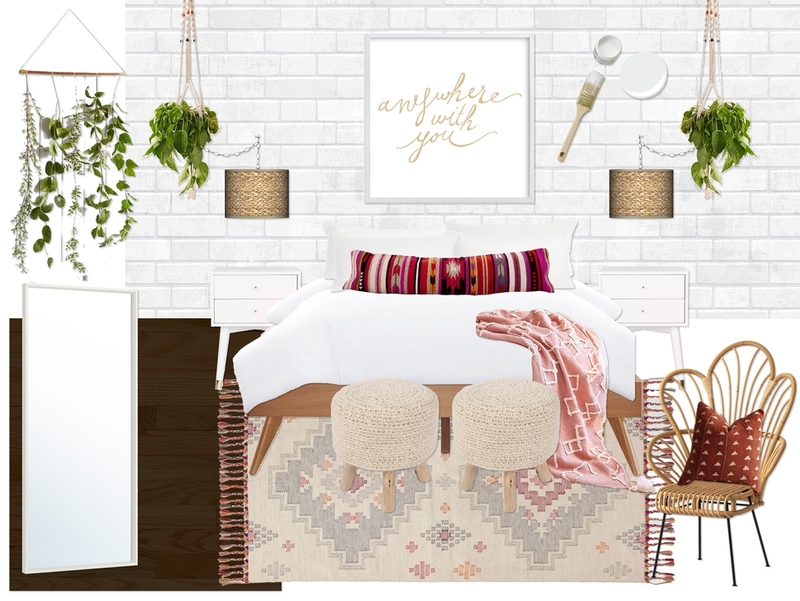 With a completely blank slate to work with, Erika was able to get to work right away by coming up with ideas that would culminate in Jules and Andrew’s soothing bedroom hideaway. In Concept 1, Erika takes an impactful approach with a soothing, calming, and pure palette and layers of white-on-white accents. 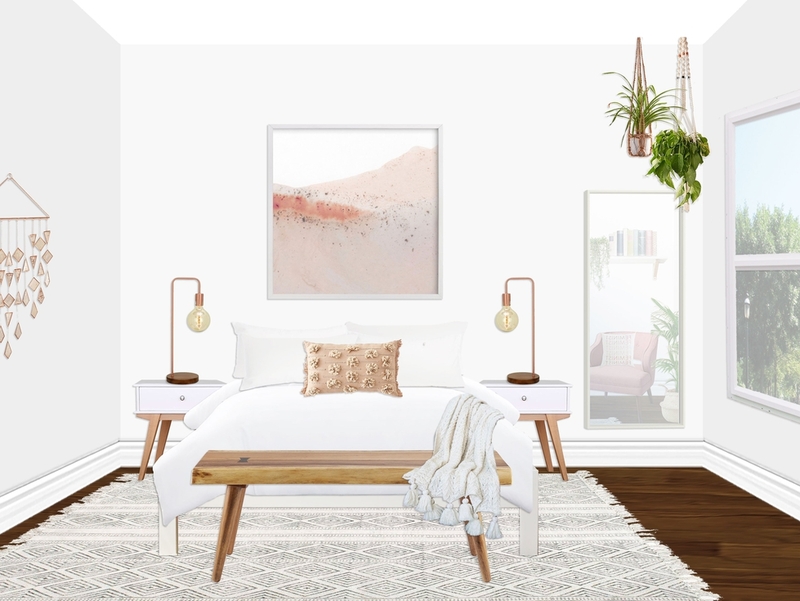 Erika incorporated botanical touches, from live greenery to a minimalist photograph above the bed, to enliven the bedroom and provide it with a sense of coziness. Meanwhile, she opted for mid-century-style nightstands and benches that add to the overall clean-lined and airy appeal of the room. With concept 2, Erika worked in a brighter palette that is nonetheless calm-inducing, bringing to mind the hues of sunrises. She wanted to instill a sense of relaxation with natural materials, such as seagrass pendants, a rattan chair, a mud cloth throw pillow, and woven ottomans. It all adds up to a bedroom that’s both cozy, warm, and restful. In reviewing the two concepts together, Jules and Erika ultimately decided to go with a bedroom that closely resembled the first concept. 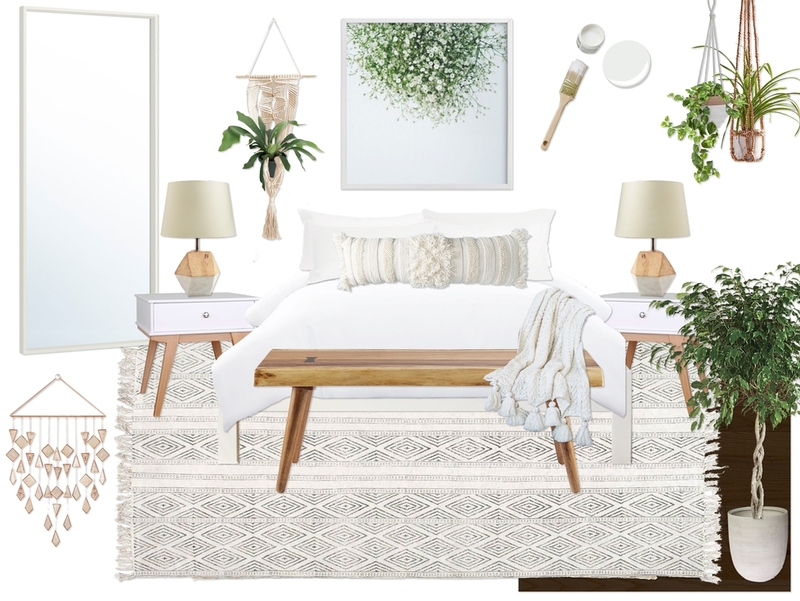 With the exception of the art, bedside table lamps, and a comfy upholstered corner chair, here’s Jule’s final dreamy white bedroom design! The overall white palette with light wood tones is one that’s right on point with Jules and Andrew’s combined aesthetic. Matching nightstands and the white bed make for perfect centerpieces since they provide a clean and uncluttered look that distracts from the bedroom’s small size. One of Jules’s non-negotiables was that the bedroom is a tech-free zone and the minimal storage definitely helps to encourage that. The artwork above the bed also adds a warm burst of color without diminishing the airy appeal of the space. And plants act almost like sculptures, filling the corners as well as drawing the eye up and around the room. Inspired to give your own living space a head-to-toe makeover? Try Decorist now!